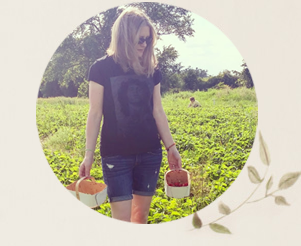 Last week I shared a look at the newly painted shed window boxes and chairs that now grace our backyard. 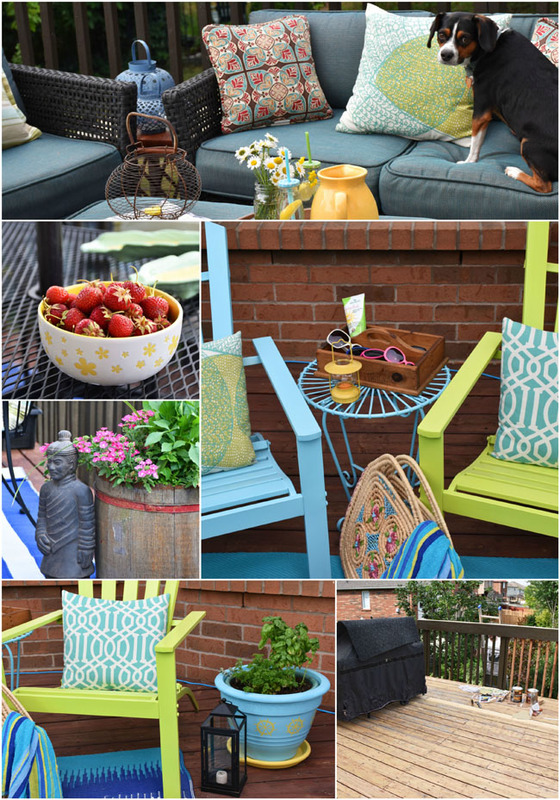 In Summer Yard Tour Part One I also showed just how many pieces of our outdoor furniture and accessories required spray painting this year. (Hint: there were a lot!) In today's Summer Yard Tour Part Two, I want to show you our refreshed deck area. It was looking quite sad over the fall and winter months and it was definitely due for some summer lovin'. 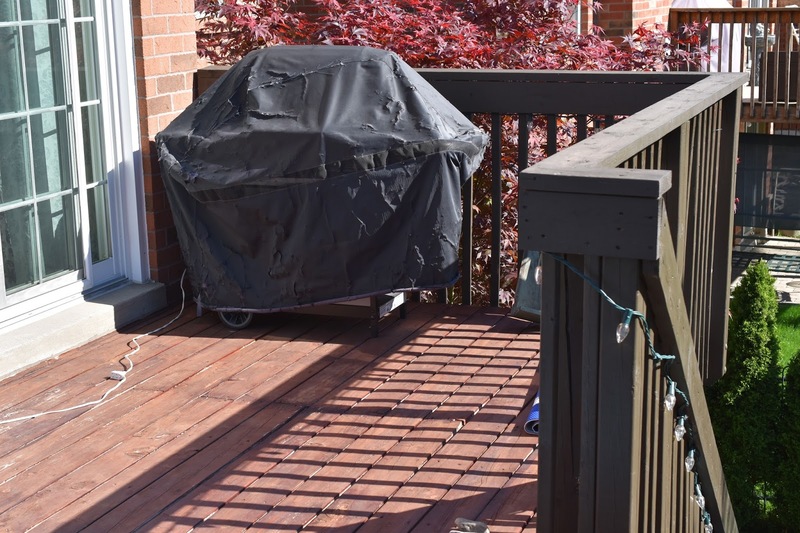 A large portion of our backyard space is taken up by the deck. (Our walkout basement leads to a patio space under the deck as well.) My husband spent a good majority of last summer (no joke) sanding the red-maroon stain off of our deck. Suffice it to say that the previous home owners chose the colour and I would NEVER choose to do a solid stain again. We would have gone to a transparent stain or even just some sort of wood finish if we could, but he just couldn't get the old colour completely off. So we went with two different stains - a semi-transparent stain with more red in it on the deck and a solid brownish-black stain on the spindles. Here's one of those decorative puppies I mentioned in the title of this post. I mean, what better decoration is there for your outdoor space (or your indoor space for that matter) than a cute dog? As you can see, Ace is free to make himself at home on our patio set (which we purchased a couple of years back). At the same time we also bought two outdoor rugs in various shades of blue. Those have held up well so far. We spray painted the twig planter baskets with leftover bronze paint we originally used for our diy owl bookends. There was a day and time we would have just tossed them in the garbage! (See how bad they looked in my first summer yard post.) This diy thing is not only fun - it's also great for keeping things from landfill! The wooden folding table probably shouldn't be outdoors, but it was sitting in a closet unused and I figure we'll paint it soon anyway (when I can stand to paint again). I put a blue trio of lanterns (purchased at a basket sale) on the table. They hold tealight candles that will help make our deck cozy on summer evenings. These Muskoka-style aluminum chairs were two of the furniture items we spray painted this spring. We used bright colours to add some cheer to the seating area. On the side table (which actually goes with the chairs in my last backyard tour), I put out a bunch of fun and inexpensive sunglasses, sunscreen and hand wipes in a thrifted wooden box with a convenient handle. The little yellow lantern is also from a thrift store. We used three colours of spray paint for the yard - aqua blue, lime green and black. We also used a sunny yellow mineral paint. 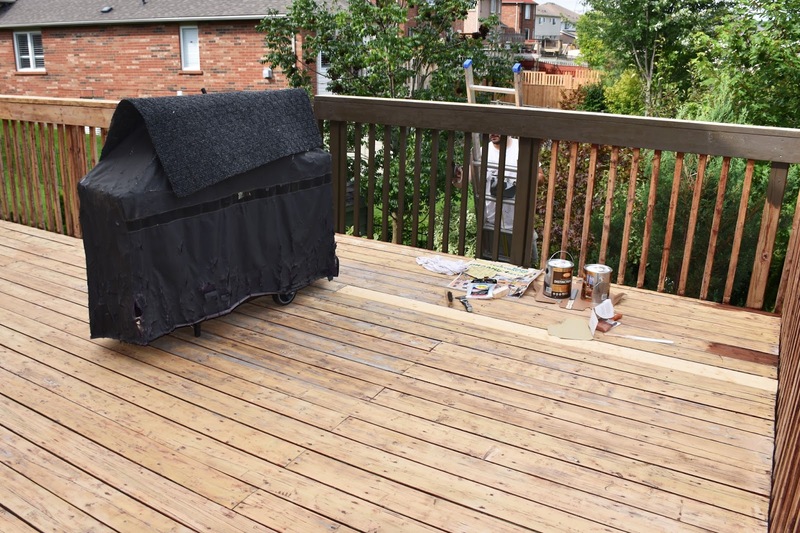 I brought all of the colours together on the deck through the painted Muskoka chairs and the diy spray painted and stencilled terra cotta herb planter. Here is our black metal dining set, which also got a spray paint refresher. Now I'm on the lookout for an outdoor tablecloth with a hole in it. When it's not too sunny in the evenings, we'll take our dinner out on the deck. I have so many thrifted and gifted lanterns and candle holders. I have a cupboard full of them in the basement! So I'll have to remember to rotate the accessories out once in a while. And let's all strive to make the most of summer, shall we? Raise a glass to sunny days, beach trips, swimming pools, cottage living, temperate evenings, shared laughter with friends and glimpses of fireflies. Have you given your outdoor space a refresher this year? Sounds like a great deal! And a rug can make such a difference in brightening up a space. Enjoy the camper!